This is a low-tech as you can get. There is no sewing machine involved, but only a needle and a thread. With a pattern, hand-sewn sheep, calves, penguins, birds, reindeer, pigs, flamingos, rabbits, and pandas can be fashioned before your very eyes. Since they are hand sewn, each animal is distinctly different. Each animal is given a name and a fictitious history is created. The history describes where the animal was found, a little bit about its personality, and information on its likes and dislikes. I also make Itty Bitty Friendship Hearts which can be passed on to friends and relatives or just to keep for yourself. I am a retired school teacher who was looking to develop a crafting hobby during retirement. I did a lot of sewing of garments and even darned socks! I never thought of sewing as a career choice or even as a hobby. I started out when I found a project to make a reindeer in a Better Homes and Garden Christmas book. I had a lot of trouble getting it put together correctly, but I love challenges and kept working at it until I got it right. 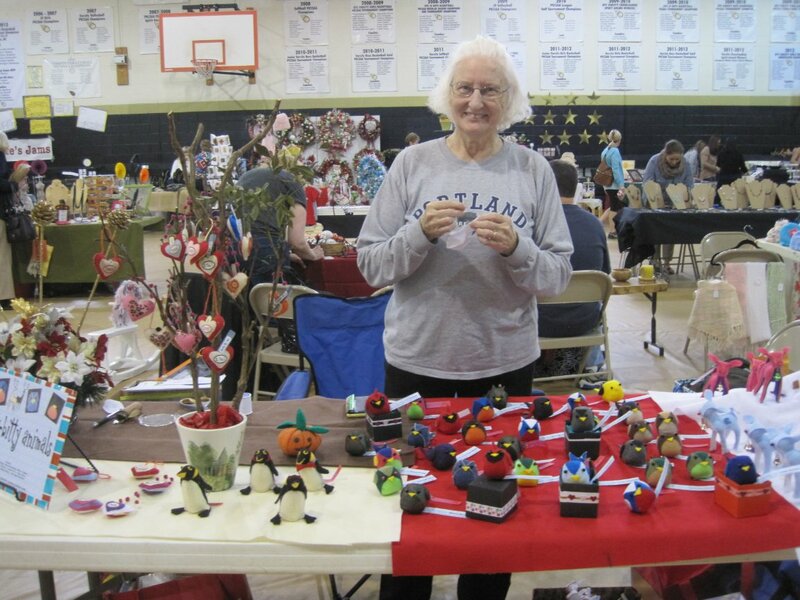 Then I moved into making birds for the Piedmont Bird Club’s 75th anniversary in April, 2013. I distributed them as table favors and everyone seemed to enjoy them. I am surrounded by dogs, cats and fish. I love animals and I like to imagine what it would be like to be that animal and picture its story in my mind. Another source of inspiration is Antiques Roadshow. I want my collection to be thought of as “collectibles.” Adopt the animals now, and in 20 – 30 years, they will be worth much more. You can think of it as investment. My first experience was a December craft fair at St. Pius X School. I literally sold out and was hooked from then on. I gradually signed up for more craft fairs which were not quite as successful but my initial success spurred me on to continue. I also took a business class sponsored by the Chamber of Commerce in conjunction with the Small Business Center. Itty Bitty Animals Adoption Center was a featured artist at the First Friday Indie Market on September 5, 2014. The market is no longer active.